(Nanowerk Spotlight) Thin, flexible displays have become an everyday component in many electronic gadgets from cell phones to digital cameras and MP3 players. Most of these displays are based on LCD technology, liquid crystals combined with polymeric structures, and one of their drawbacks is that their manufacturing cost grows rapidly with increasing screen size. 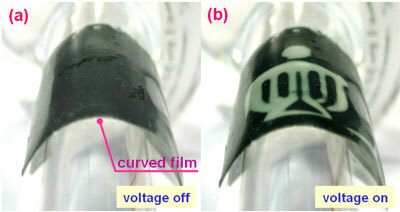 A recently developed alternative approach for thin, flexible displays makes use of thermochromic composite thin-films. Thermo- chromism is the ability of a substance to change color due to a change in temperature. This first of a kind thermochromic display is based on films with thermochromic nanoparticles and embedded conductive wiring patterns. Based on the ease of fabrication and simple architecture, thermochromic displays could have advantages in lowering the display unit cost and, due to their heating pulse control scheme, can also lower power consumption compared with conventional displays. "Our display is based on two composite materials: thermochromic polymers and silver-PDMS conductive composites" Dr. Weijia Wen explains to Nanowerk. "PDMS (polydimethylsiloxane) plays an important role for our thermal displays, mainly due to its desirable wetting characters with thermo- chromic nanoparticles and silver powders. Thus a thermochromic or conducting polymer gel can be easily made. With soft-lithographic technique, the conducting composite offers advantages of ease in patterning microconducting wires and in integrating electrical circuits." Wen is an Associate Professor in the Department of Physics, at Hong Kong University of Science and Technology. His group has developed this novel technique of combining a PDMS-based conducting composite with a thermochromic composite to fabricate a paperlike display. Wen and his team invented these PDMS-based composites, which have shown good performance in both mechanical and electrical characteristics. 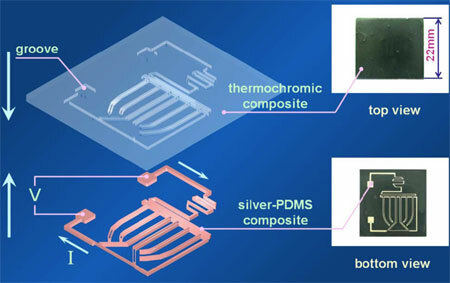 "We have previously developed micro heaters and relevant patterning techniques based on silver-powder–PDMS composites ("Microheaters fabricated from a conducting composite")" says Wen. "Then we realized that thermochromic materials could offer another way for fabricating displays besides LCD and plasma technologies; and it might even have many new features and advantages over these traditional displays." Wen explains that the critical issue for paperlike displays is the electrode fabrication where flexibility and reliability are important aspects. "Owing to our recent invention of PDMS-based conducting composites, which we have used to fabricate flexible electrodes, this problem was solved. The use of thermochromic materials for display became very natural after that." The thickness of the paper-like film of approx. 150 µm enables the film to bend and fold while preserving the normal displaying functions. Once a voltage is applied, the logo image appears promptly, as shown in the example below. "With such mechanical flexibility, our thin-film thermochromic display can easily adapt to a variety of application environments" says Wen. Compared with more traditional LCDs, this display has a very simple structure, is cheap to fabricate and has a relatively low power consumption. One potential applications for this technique could be the fabrication of thermal monitors for use in bio-microchips. Wen and his group are already working on this. "So far we have only developed a display which shows a logo" says Wen. "In a next step we may be able to construct thermal pixels. The combination of pixels with programmed signals may generate controllable and variable images. In order for our display to compete with existing display technologies our goal in developing it further is focused on these aspects: low cost, low energy consumption, thinness and highly controllability." These findings have been published in a recent paper, titled "Paperlike thermochromic display", in the May 21, 2007 edition of Applied Physics Letters.